Clear Health Analytics | Are High-Deductible Health Plans a Good Idea? Premiums are rising, but is a high-deductible health plan something your employees will struggle with? It’s nearly open enrollment season, and Benefits Directors are gearing up. Unsurprisingly, health plan premiums are on the rise and after speaking with your plan administrator, it’s likely one low-cost option on the table is high-deductible health plans. But as soon as your employees see that big, round number on the deductible line, they may just line up outside your door with pitchforks (or so you fear). Before you narrow down your options, it’s best to be informed on how high-deductible health plans will affect your employees’ well-being and their wallets. Despite the initial shock surrounding high-deductible plan figures, evidence exists that these plan types actually save employees (and employers) money. But experts suggest HDHPs should not be introduced as stand-alone cost-cutting measures. Money can only be saved if an employee is educated on how HDHPs work. And the latest figures from corporate employers surveyed by the National Business Group on Health indicate that the use of high-deductible health plans will drop by nearly 10% this enrollment period (currently, 39% of workers have HDHPs as their only insurance choice from their employer). “It got to the point where employers were worried about the affordability of healthcare for their employees, especially their lower-paid people,” said Beth Umland, director of research for health and benefits at Mercer. Deductibles have risen faster than wages and the cost of family coverage has risen by 5% this year, which only serve to make it more difficult for employees to afford their health care costs. HDHPs are complex and difficult to understand for many consumers who may receive little guidance from their employers on health plan choices. Some of the push back on HDHPs is that they seem to disproportionately effect low-income enrollees. JAMA found that 47% of low-income individuals with multiple chronic conditions and a HDHP were paying more than 20% out of their family income on health care expenses. With a strengthening job market and increasing premiums, employers are turning to other alternatives including educating their workforce on wellness benefits and financial planning. It’s not that a high-deductible health plan is impossible to make work at your organization, but rather that employers need to anticipate and educate around employee needs, writes FierceHealthcare. Research has shown that high-deductible health plans can actually save money if accompanied by lower premiums and employer contributions to health savings accounts. “Typical savings for HDHP enrollees amounts to $500 a year,” according to data that was studied by the National Bureau of Economic Research in 2015. 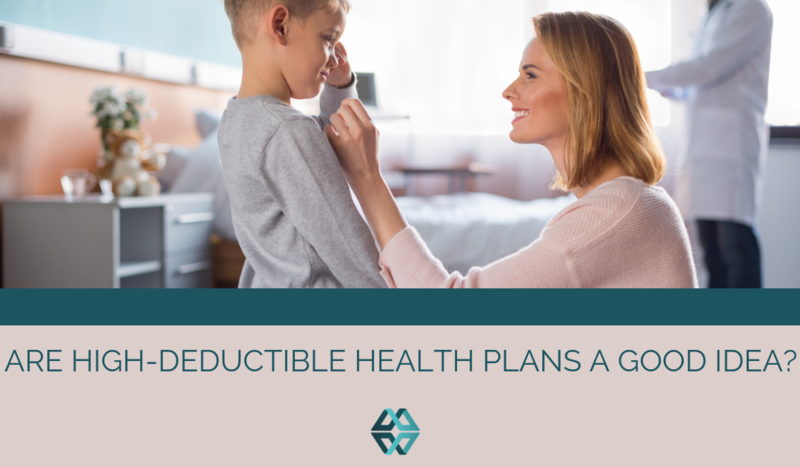 As your health plan rolls out HDHP, go ahead and prepare to educate employees about how to use their high-deductible health plans effectively. A helpful tool for many employees is a custom health insurance cost estimator tool. Employees can put in specific information and estimate out-of-pocket costs based on the plan options you offer. Factors like additional benefits, prescription drug prices, and anticipated doctor visits can be included so that your employees are able to fully anticipate accurate costs associated with their health care. A new report (issued in September) by Alegeus indicates that “consumers are generally uncomfortable when making both healthcare and financial decisions.” 50% of those surveyed could not answer simple true or false statements about health care premiums and deductibles, while around the same number also struggled to understand general plan info (like pros and cons between plans and how the services counted towards their deductible). The report concluded that “delivering education around health savings accounts and other consumer-directed options could help bridge the gap,” noting that employees and employers stand to save $85 billion and $22 billion respectively. With the right tool in place, employers can empower employees to utilize HDHPs and other benefits appropriately, while also preparing for out-of-pocket costs. In this relationship, everyone stands to save. Learn exactly how Daizy supports Benefits Directors with a free demo.